I've decided to show you Paris in a new way... Not only through my eyes, but through the ones of its inhabitants : les Parisiens... To do so, I've started a new blog, called Portraits parisiens, in which I only photograph - and video interview - people who live in Paris (and suburbs). It's a new - time consuming - project, but it allows me to meet new people, learn new techniques (people are harder to photograph or film than buildings!) and it's fun! There won't be one per day of course, but as often as possible... You can visit it right now (I officially launched it today! ), follow it on Twitter and/or like it on Facebook. I'm also open to your suggestions. Have a good week everyone. This is terrific, Eric. And it will help me learn more of the French language - J'espere! And for once I was first at something - your first follower on Twitter - at least according to Twitter. Bon chance avec le nouveau blog. Congratulations on this new launch, Eric. One thing we can always count on from you is change and innovation. . .you are always reaching for new heights. Enjoy this new venture. I know we will be delighted and that you will get much pleasure from your experiences. Steph in Haninge, Sweden has been photographing and interviewing people for many years now on his daily photo blog and Flickr sites, and I have greatly enjoyed his work (and "met" a lot of interesting folks through it). Can't wait to "meet" your Parisians! Ca fonctionne ; on entre très vite dedans. J'espère qu'il y en aura beaucoup d'autres tout aussi charmants à découvrir. This is just wonderful! Like Scooter, I bet these videos will help me brush up on my rusty French. And I think I was first to like on Facebook. Franck is great, and he recommended all of my favorite little museums! I'm going to forward the site to my friend the French teacher. These videos would be wonderful for her students. Well done! Great idea!! Bonne chance avec le nouveau projet!!! What a wonderful idea, Eric. You will be brilliant at this! Quelle idée géniale, Eric! 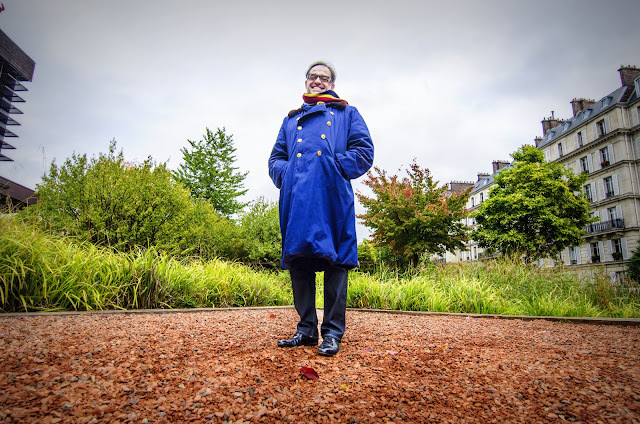 I loved meeting Franck (in his fabulous manteau bleu) and I look forward to more interviews. (As for suggestions, I think you should interview Michael (who has certainly earned his place as un vrai Parisien). thanks for this new and absolutely excellent launch.... I too love Franck's manteau (and the blue is so much nicer in reality than on the 'enhanced' photos) and even more I liked his intelligent and captivating declaration of love for Paris. I have one question: Wd you be kind enough to add an 'email newsletter' to the Portrait Parisien for people like me who refuse to be on FB & Twitter. Un grand merci! btw; made same experience as Monica; although I use Explorer 9 (latest), PP wouldn't accept entry. Love the project very much Eric. Bravo! Merci beaucoup for your nice words everyone! I did forget to mention the whole site would be in French only (an English version may happen one day, but not soon, for it's a lot of work!). Great idea, Eric. It will now give me motivation to dig out my Petite Larousse and try to improve my reading knowledge of French. This idea sounds really good, Eric. Portraitsparisiens.fr est un projet extrêmement intéressant au coeur de lignes directrices qui te ressemblent : découvrir, rencontrer, partager. Et qui complète merveilleusement bien les internationaux PDP & CDP. J'imagine que Portraits parisiens représente pas mal de temps à y consacrer (choix du portrait, connaissance du sujet, préparation des questions, organisation agendas respectifs, lieu, horaire, montage, etc). Tu vas rapidement avoir besoin d'un stagiaire et/ou d'un mécenne! ps : je pourrais peut-être être utile dans la première catégorie, plus difficilement dans la deuxième.. ;)) A toutes fins utiles. Effectivement Madeleine, je mesure tout juste la difficulté d'arriver à en publier un par semaine. Je ne suis pas contre prendre un ou une stagiaire, mais qu'est-ce que je pourrais bien lui apporter ? Plein de choses mais rien que tu n'aies à donner à tes dépens. Le tout est de trouver l'équilibre intuitif entre ce qu'il/elle t'apporterait de charge en moins et de moments partagés en plus. C'est sur la charge en moins qu'il y a à réfléchir parce que sur les moments à partager en plus, il n'y a pas de doute compte tenu du projet. Le profil, là c'est pas compliqué. Quelqu'un d'intègre, d'intelligent et qui a de l'énergie !! Il y en a beaucoup... Napoléon Bonaparte aurait dit que l’art le plus difficile n’est pas de choisir les hommes mais de donner aux hommes qu’on a choisis toute la valeur qu’ils peuvent avoir. Je crois bien que tu es sur cette ligne et je trouve que c'est intéressant comme sujet.